Eastleigh crashed to a 3-1 home defeat in the first leg of their play-off semi final against Dover Athletic and ended the game with nine men having both Adam Watkins and Michael Green sent off. Thanks to a 1-1 draw at Conference South champions Welling United on Saturday, the Spitfires finished fourth in the division to set up this two-legged play-off tie with Dover Athletic. Eastleigh came in to this play-off semi final in strong form on the back of an unbeaten run of nine games. A night full of drama and intensity saw the crowd of 915 at the Silverlake Stadium witness four goals and two red cards this evening. The Spitfires fell behind to a goal after just 20 seconds when Moses Ademola opened the scoring. Ben May then doubled the visitors' lead with a fine volley in the 18th minute in a first half that the Whites controlled for the most part. Eastleigh Football Club today announced the 2013/14 season ticket prices. With a fantastic early bird offering, including additional benefits; we feel our season ticket prices again offer excellent value for money. For the second season running - a season ticket to watch the Spitfires will cost no more for an adult than a £5 a game average with further concessions on these prices depending on your circumstance. Chairman Stewart Donald said "As a club we feel that it is vital our season tickets represent good value for money and we recognize following a football club at any level can be an expensive passion. If you also factor in the current economic climate then as a club we feel it is essential to make following Eastleigh FC as affordable as possible. Eastleigh Football Club are today delighted to announce a new kit deal with the worldwide sports manufacturing brand Nike. 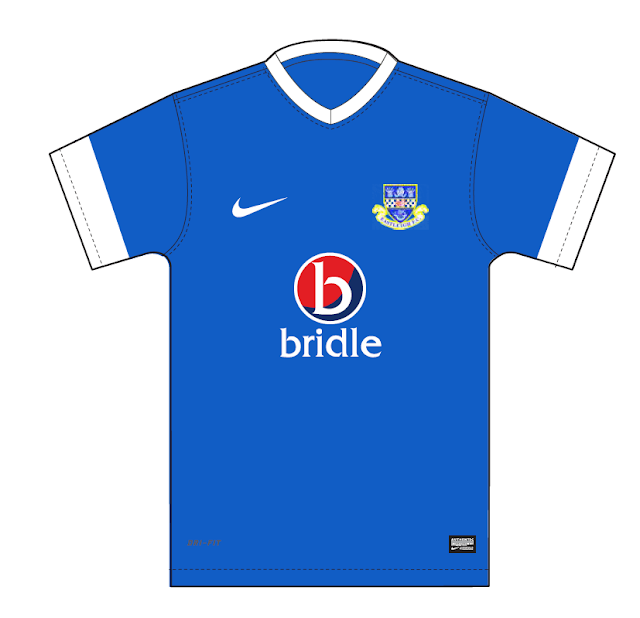 Next season will see all Eastleigh teams from the first team to under seven's play in the new Nike kit. The home kit sees a move back to the clubs original royal blue with white trim, whilst the away will see the reverse with a white shirt with blue trim. Sales and Marketing Manager Owen Clark said: "Aligning our Football Club with a massive sports manufacturer like Nike goes along way to enhancing the Eastleigh FC brand, which we are keen to build on still further. “I am also very pleased to announce we will be the only football club outside of the English Football League to have a centralised agreement with Nike. As a non league football club it is very difficult to get a centralised agreement with Nike, so the fact they have chosen to work with us is another development as we look to attract more fans and commercial partners. If any remnants of doubt still existed about whether or not Eastleigh can be counted among the very best teams in this division, they were surely wiped away in the course of this performance at the home of its champions. Welling are the most impressive side to have visited the Silverlake this season and, during a swashbuckling start to this game, looked set to mark their day of celebration with a glittering win. By the time 90 minutes was up however, the Spitfires had a point and could rightly consider themselves unlucky not to be leaving Park View Road with all three. Eastleigh have finished the season in fourth place after today's 1-1 draw away at champions Welling United. Craig McAllister scored an equaliser late in the game to secure a point. The Spitfires will now face Dover Athletic in the play-offs. Eastleigh will play the home leg of the Play-Off Semi-Final v Dover on Tuesday night (30th April). 7:45pm kick off. The reverse fixture at Dover Athletic will be played on Saturday 4th May at 3pm. Eastleigh tonight cemented their place in the Conference South play-offs for the second time in the clubs history with a 3-1 home win over Truro City in front of a bumper crowd of 1,320. Starting 2013 at the wrong end of the division, Richard Hill's side have turned their form and their season around in dramatic style to ensure this fantastic achievement was possible. The Spitfires have stormed up the table with 15 wins since the 8th January, and are currently on an eight-game unbeaten streak (seven of which were victories). Craig McAllister had the perfect opportunity to open the scoring inside five minutes but saw his penalty kick well saved after Dale Binns was pushed in the area. 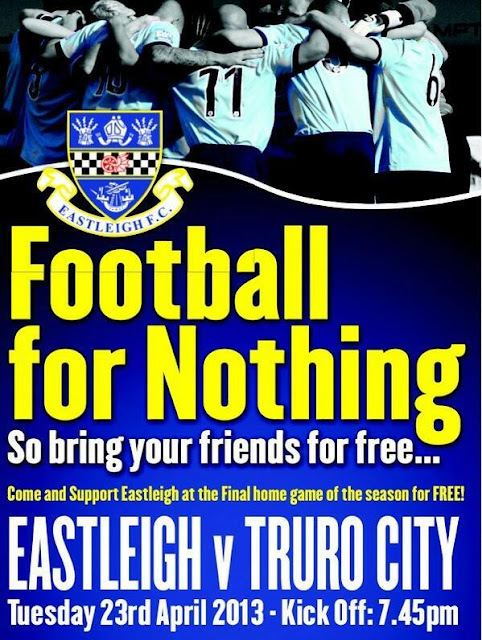 Eastleigh FC are pleased to announce that Tuesday's game (23rd April) at home to Truro City will be free entry to all visitors. We would like to thank everybody for their fantastic support this season and will hopefully get a large attendance on Tuesday as we continue to push for a play off position. Kick off against Truro is at 7:45pm so please invite as many as possible to give the team fantastic support in our final home game of the season. A second hat trick in as many games for Craig McAllister helped Eastleigh edge ever nearer to cementing a place in the play-offs for the Spitfires. In the end it was a comfortable and resounding victory for the hosts, but Eastleigh had to come from behind to cancel out a Mikel Suarez opener halfway through the first half. Craig McAllister scored a header from a corner on the stroke of half time to ensure the scores were level at the break. Eastleigh went on to produce a perfect second half performance with two more from McAllister and a Dean Beckwith goal sandwiched in between. Should Eastleigh beat Truro City on Tuesday night, where admission is free for all spectators; Richard Hill's side will have clinched a top five finish and with it a shot at securing promotion to the Conference Premier. A hat trick in the space of ten minutes from second half substitute Craig McAllister ensured Eastleigh climbed back into the play-off positions. The Spitfires saw off Bromley with a 3-0 victory at the Silverlake Stadium to continue their rich vein of form. Richard Hill's side are now unbeaten in six consecutive games and also undefeated in ten successive home matches. Their were three changes to the Eastleigh side that went to Bath City and drew 1-1 at the weekend. Mark Hughes and Damian Scannell were both back from suspension and started tonight; and Corey King also came in to starting eleven at the expense of McAllister. Michael Green missed tonight's game with a dead leg sustained on Saturday, whilst Dale Binns became a father recently and wasn't involved in the squad tonight. The bare-chested, shirt-twirling euphoria of Eastleigh’s man of the moment Adam Watkins after he had crashed in an Eastleigh equaliser deep into stoppage time at Bath City’s Twerton Park, provided a fitting conclusion to the visitors’ late siege on their hosts’ goal. Watkins’ glee was matched by that of his team-mates, management, and fans alike as the Spitfires gained a point which, given that defeat was looking increasingly inevitable, might prove vital in both its contribution to a top-five spot, and to maintaining the momentum which exists at the club. Richard Hill made a single change to the eleven which started Tuesday’s win at Truro. Craig McAllister was given the lone striking berth, with Corey King making way and Chris Zebroski filling the wide-right spot. Alex Lacey therefore continued in central midfield alongside Glen Southam. EASTLEIGH’S remarkable transformation from potential relegation fodder to serious promotion contenders continued tonight as they muscled their way into the Blue Square Bet South play-off zone. Richard Hill’s side – second to bottom at the start of the year – are up to fifth place after triumphing 3-1 at relegated Truro City. The highly-rated midfielder/forward netted a superb 30-yard strike to give the Spitfires a ninth-minute lead. Substitute Craig McAllister doubled the advantage midway through the second half, chasing the ball down and knocking it round the keeper, and Reason rounded off a memorable night with a sublime 81st-minute chip. Eastleigh took another step towards securing a play-off place by winning a third successive league fixture having picked up all three points at home to AFC Hornchurch this afternoon. As we approach the business end of the season, the Spitfires have hit a rich vein of form at precisely the right time to climb to sixth in the table, with games in hand over the sides currently occupying spots in the top five. Make no mistake, there is still a lot to do between now and the conclusion of the campaign; but Eastleigh are certainly heading in the right direction and as things stand – matters are in their own hands. The other promotion hopefuls are perhaps starting to feel the pressure as well with three of the top five losing today.